Pioneers in the industry, we offer pvdf series 25 pump, pvdf series 40 pump, pvdf lined centrifugal pump and pvdf cetrifugal process pump from India. The fluorinated polymers are widely appreciated for their remarkable chemical inertness and their excellent resistance to aging. Polyvinylidene fluoride (PVDF) offer the specific advantages of ease processing in accordance with all the convention methods use in a plastic industry. PVDF; Polymerized, according to its own special process , offer a high degree of crystallinity to the that by other processes, resulting among other things in superior thermo-mechanical properties. The intrinsic technical superiority is one of the reasons for the success of which PVDF has achieved on the world marker for more than 20 years. But nothing is possible without a genuine quality assurance policy which Nirmala pumps & Equipments Follows with their efforts for total quality management over their products & services. Readily processible, formable & weld able. 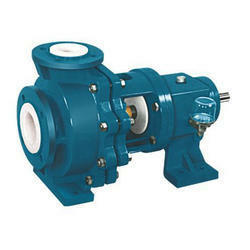 Tried & tested chemical process pump desighn for rough condition. Thick walled vaccum-proof PVDF housing in one piece. Therefore no additional sealing points in the pump housing. Replaceable PVDF Casing liner-reduces the maintenance cost. Pipe-line forces are absorbed by cast iron armour. Also suitable for high system pressure . Flange with through holes meeting the requirement of the chemical industries. Semi-open PVDF impeller reinforced by large metal insert Smooth running & long service life of Mechanical seals, thanks to the particularly heavy duty bearing pedestal. Modular system ensuring economical parts stocking . Available in 1440 as well 2900 rpm. Flow rate up to 400 m3/hr. Head upto-100mts. Back pull out design ease of maintenance. A performance test report is submitted with each pump. Consulting & servicing by specialists. Flow rate up to 400 m3/hr. Head upto-100 mts. Our organization has gained recognition as a flourishing organization for providing PVDF Cetrifugal Process Pump that is used in plastic industry. The offered pump is manufactured using superior quality components and the latest technology under the vigilance of adept professionals. 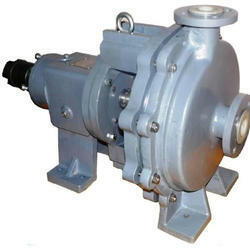 Our provided pump can be availed in different designs and sizes as per the demands of our clients. Apart from this, our valuable clients can avail this pump from us at market leading prices. The intrinsic technical superiority is one of the reasons for which PVDF has achieved success on the world market for more than 25 years. But nothing is possible without a genuine quality assurance policy which nirmala pumps & equipments follows with their continuous efforts for total quality management over their products & services.